Last week, I attended a meeting where Laura Belsten talked about the importance of emotional and social intelligence. Her presentation interested me because, just weeks earlier, I had watched a youtube video where psychologist Daniel Goleman had been interviewed on the same topic. According to Goleman, emotional intelligence has to do with self-mastery while social intelligence is about understanding and interacting effectively with others. As an advocate for self-change, I want my clients to excel in both of these areas and take every opportunity that I can to learn how to better coach people on this topic. Laura Belsten did not disappoint when she kicked off our meeting with an exercise that I could share with my readers and clients. “Think of a person you admire and write down the traits that you most want to emulate,” she explained while passing out a set of ten sticky notes to every person in the room. 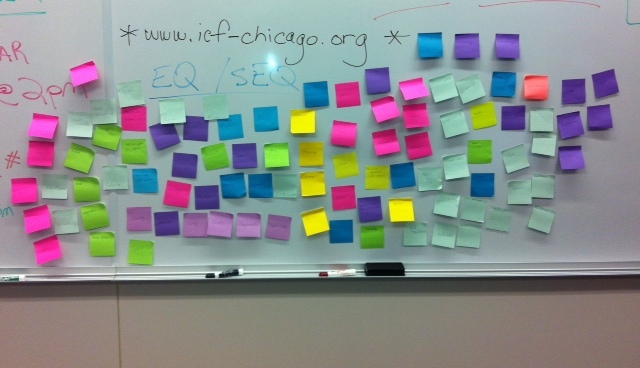 When everyone was finished writing, Laura asked us to walk to the front of the room and place each sticky note under one of the three categories that she had written on the white board: IQ, Technical Ability, Emotional & Social Intelligence. One by one, we found a home for every slip of paper. And when everyone was done, it was clear that the most admirable qualities in a person are the ones that help him or her to relate to you and me. In the end all but three of the sticky notes had been placed under the Emotional & Social Intelligence section of the white board, proving that attitude trumps aptitude; and it’s not the college attended, but the the degree of character represented that matters most. The saying is true: People won’t care what you know until they know that you care so let’s put workers above the work and make our emotional & social intelligence an ongoing priority.